Microsoft on Thursday debuted hardware for reaching into virtual worlds powered by its technology as it looked to "mixed reality" as the next big computing platform. 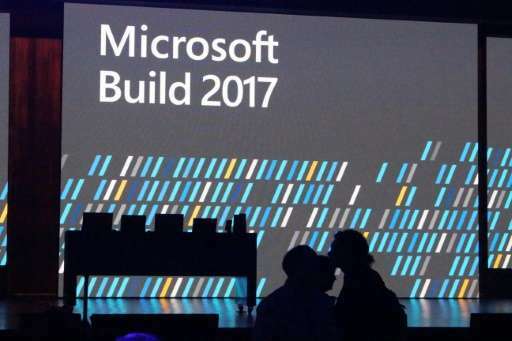 An update coming to Windows 10 operating system later this year will "see the magic of mixed reality brought to consumers around the world," Microsoft executive vice president Terry Myerson said at the company's annual Build developers conference in Seattle, Washington. Mixed reality motion controllers shown at the conference pair with headsets made by Microsoft partners using Windows software let users interact with both virtual and augmented reality. "Mixed reality is the future of computing," said Microsoft technical fellow Alex Kipman, the software engineer behind HoloLens augmented reality gear. "Windows 10 is the only operating system created specifically and from the ground up for mixed reality devices." Microsoft slipped when lifestyles shifted to mobile devices, a market dominated by smartphones powered by Apple or Android software, but is dashing forward in the budding trend of augmented and virtual realities, according to Gartner analyst Van Baker. "In some ways Microsoft is catching up, and in other ways it is out ahead," Baker told AFP at the conference. HoloLens augmented reality gear has been in the hands of developers for a year or so, but Microsoft has yet to release the gear to consumers. Partners, however, have built the company's mixed reality technology into virtual reality headsets. Microsoft has also collaborated with agencies and companies to put augmented reality to use in factories, medical schools, and elsewhere. While virtual reality devices such as those from Facebook-owned Oculus and Sony's PlayStation unit immerse users in fantasy worlds, HoloLens and similar gadgetry "augment" reality by overlaying holograms on the real world in view. With its latest devices, Microsoft is betting that both of these technologies will catch on, and is developing the hardware and software for the platforms. Members of famed Cirque du Soleil acrobatic theater group joined Kipman at Build to show how they plan to use HoloLens to design stages, settings and performances with augmented reality. HoloLens has been used by US space agency NASA to simulate walking on Mars, and by an airline in Japan to train aircraft mechanics without having to take real jets out of commission. Tens of thousands of developers in cities around the world have been dabbling with HoloLens, and it will be available for software makers to try in China by the end of this month, according to Kipman. "I just love that across the globe inspirational mixed-reality hackathons have been taking place," Kipman said during an on-stage presentation. Mixed reality controllers unveiled by Kipman will let people reach into augmented or virtual worlds, with internal sensors tracking hand movements. Microsoft had previously limited HoloLens control to pre-set gestures, such as pinching fingers together, to interact with virtual settings. Acer will sell a Windows Mixed Reality headset and motion controller bundle priced at $399 during the holiday season at the end of this year, according to Microsoft.